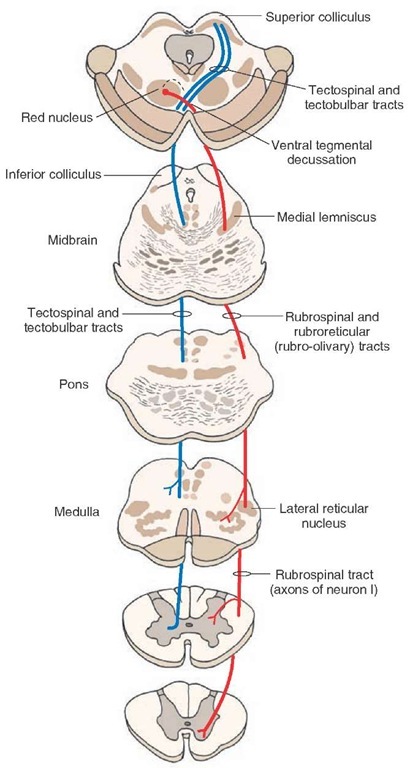 The Rubrospinal tract is a descending pathway which originates in the Red Nucleus and descends to the spinal cord. Within the literature, selective lesions have not been reported of solely the red nucleus or rubrospinal tract. Lesions within the region of the red nucleus can result in movement disorders and tremor, but these effects may be more associated with damage to fibers which are associated with the cerebellar and basal ganglia systems. In primate studies, it has been suggested that the rubrospinal tract is responsible for fractionation of movement.. Fractionation is the ability to isolate movement to one joint independent of another. Therefore, it could be hypothesised that if the rubrospinal tract was affected, this could have an impact on the fine tuning and fractionation of movement. However, even though it has been shown within animal studies that the rubrospinal tract can assist with functional recovery, it is unclear as to how this can be generalised to humans. Wheel Running Improves Motor Function and Spinal Cord Plasticity in Mice With Genetic Absence of the Corticospinal Tract. ↑ Martinez-Lopez1 JE, Moreno-Bravo1 JA, Madrigal1 MP, Martinez1 S, Puelles1 E. Red nucleus and rubrospinal tract disorganization in the absence of Pou4f1. Front. Neuroanat 2015;9:8. ↑ Kidd G, Lawes N, Musa I. Understanding Neuromuscular Plasticity. London: Edward Arnold, 1992. ↑ Scheets PL, Sahrmann SA, Norton BJ. Use of movement system diagnoses in the management of patients with neuromuscular conditions: a multiple-patient case report. Physical therapy. 2007 May 15. ↑ Onodera S, Hicks TP. Carbocyanine dye usage in demarcating boundaries of the aged human red nucleus. PloS one 2010; 5: e14430.